3V Tech joined the European consortium named BISIGODOS to produce valuable algae derived chemicals, amino acids and high added-value bio-resins starting from algae biomass fed directly with CO2 from industrial emissions (cement, steel factory, thermal power plants, etc.) as a raw material that is cost-effective and renewable. 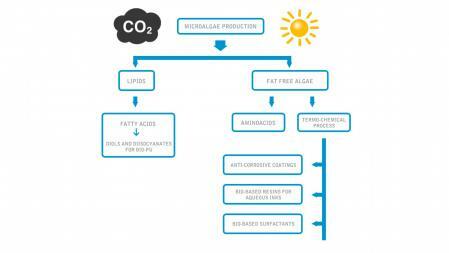 The process is assisted by solar radiation, nutrients and sea water microalgae. The BISIGODOS consortium brings together a wealth of expertise and resources within the areas of microalgae and photo-bioreactors production and optimization, manufacture of amino acids for food products, production of conductive polymer coatings, bio-resin development for water-based inks, bio-surfactants production and bio-PU adhesives manufacturing, and end-users in the food, flexible packaging, hair care, metal industry and paints products. 3V Tech assists BISIGODOS in navigating the various stages of project to ensure that the thermal separation is designed and built as efficiently and cost effectively as possible.